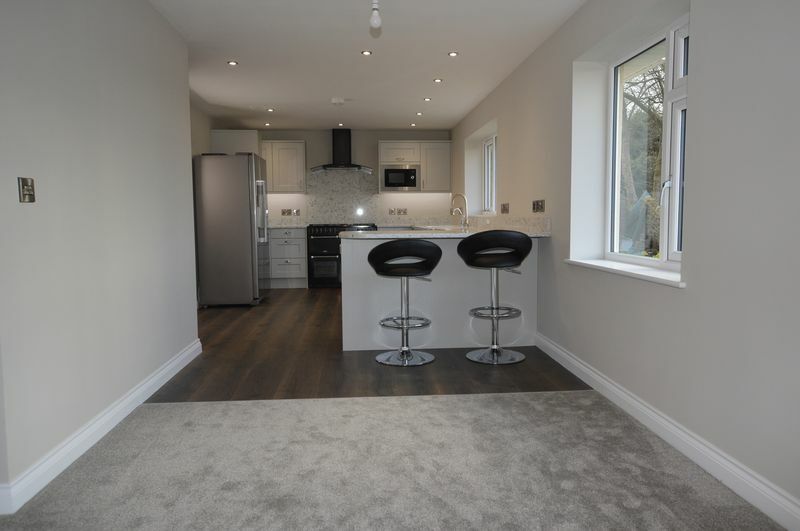 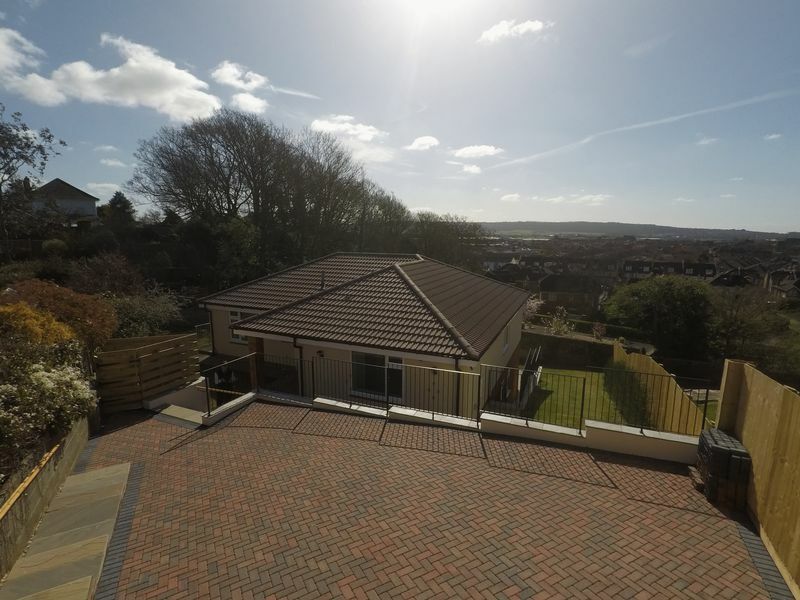 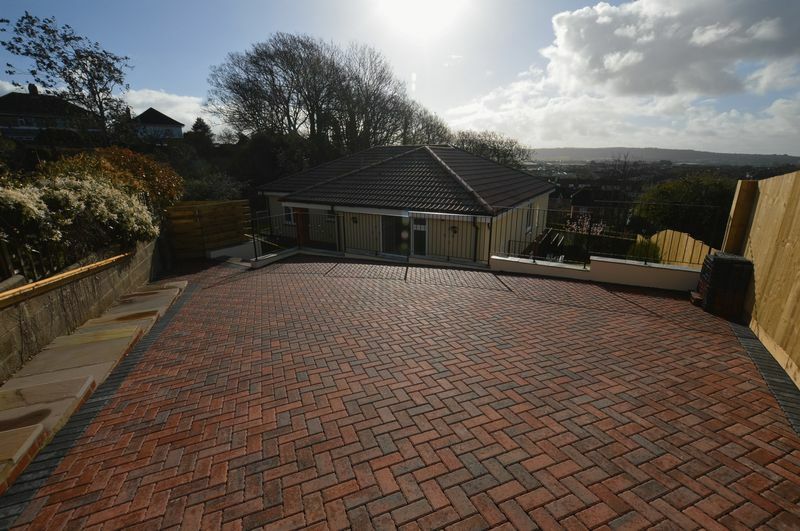 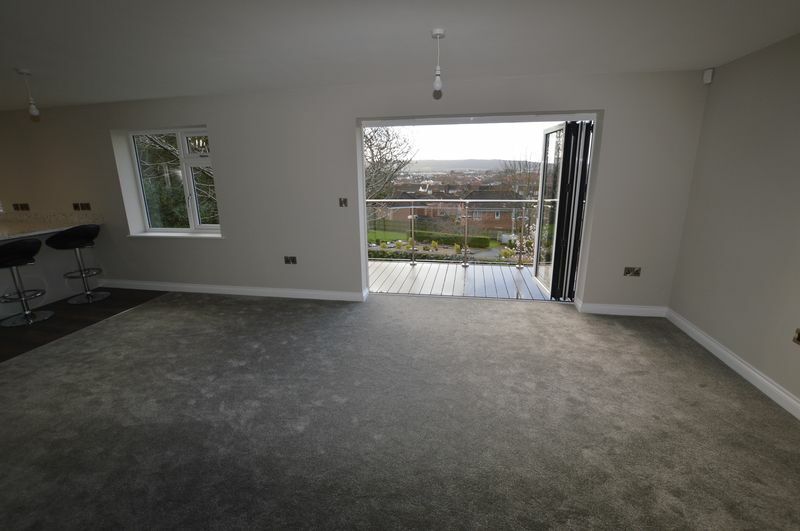 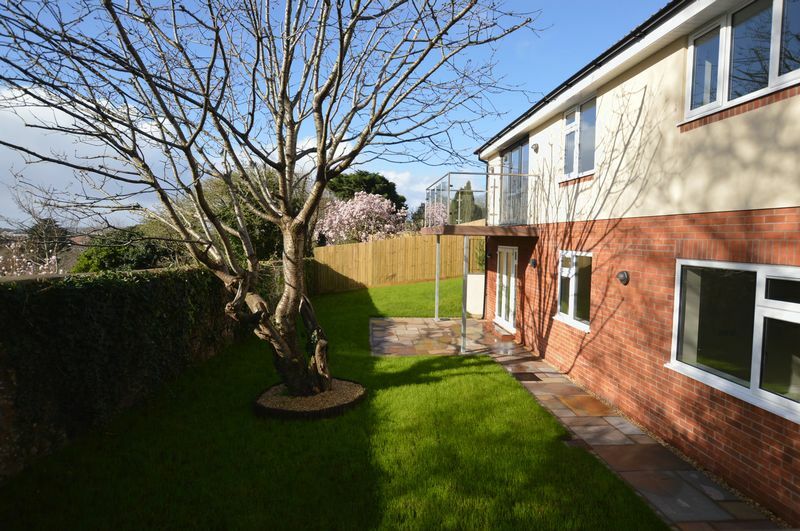 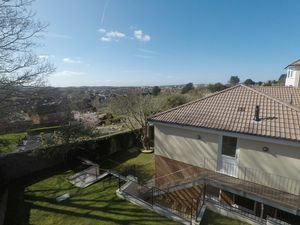 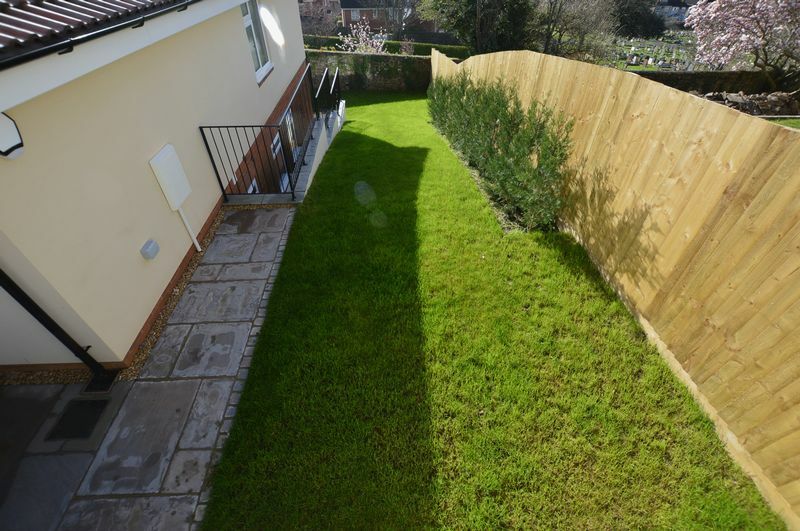 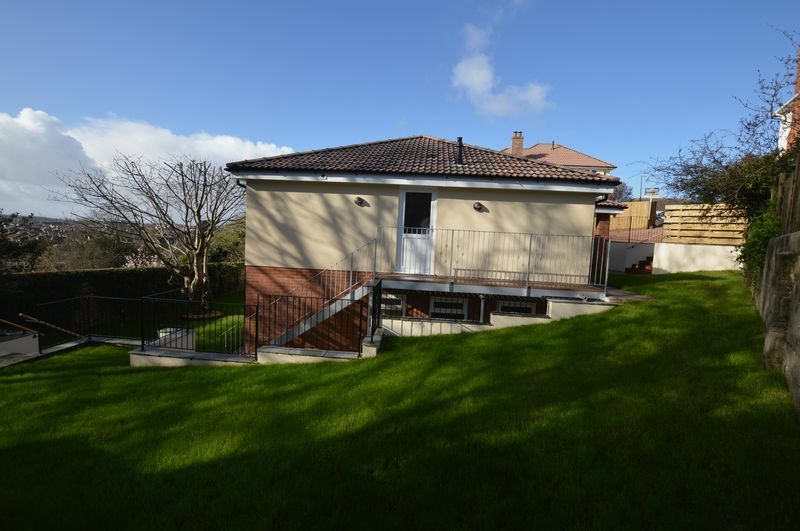 PART EXCHANGE CONSIDERED...Prepare to be delighted by this fantastic, newly built dwelling which has been finished to an exacting standard and is nestled into the hillside above the town in a quiet cul-de-sac. 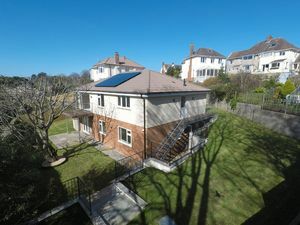 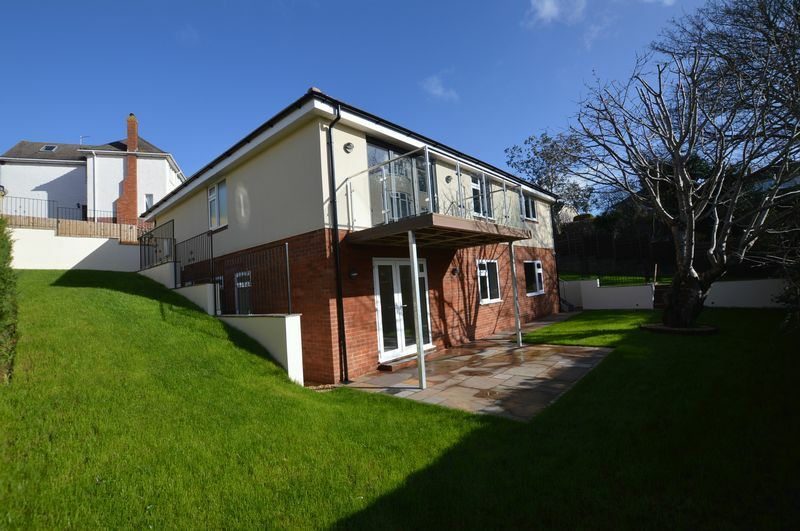 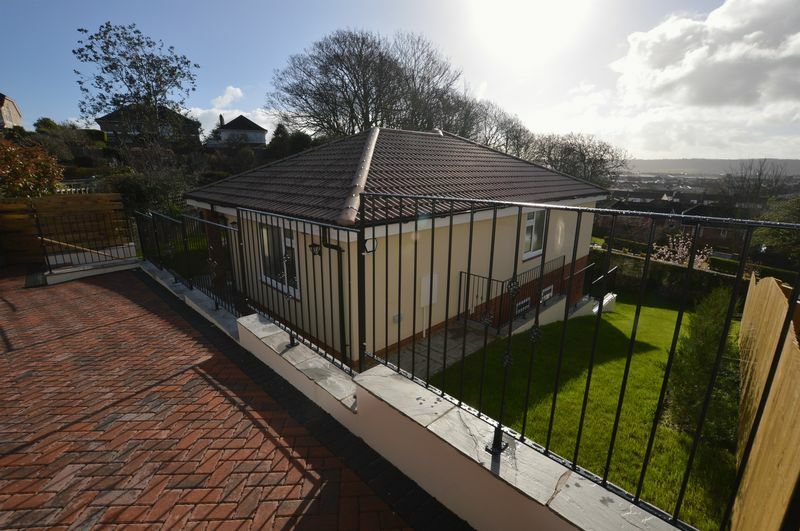 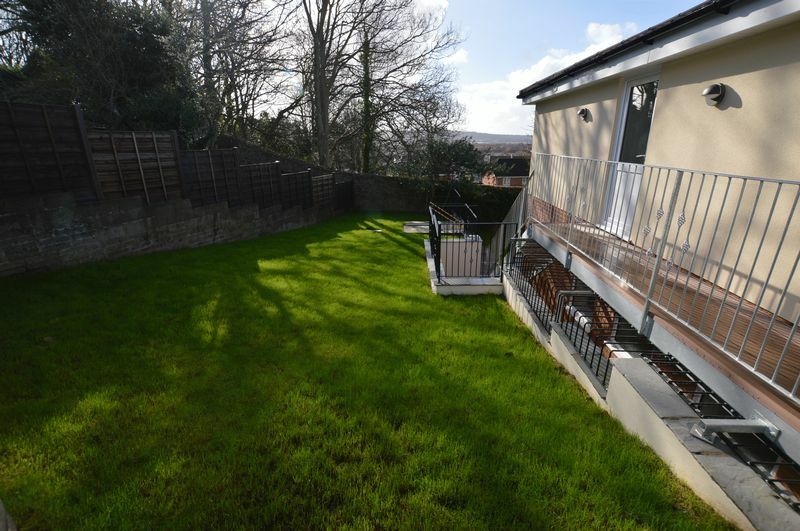 Designed and constructed by a highly regarded local developer the property is generously arranged over two floors and offers upside down living to enable you to make the most of the stunning views. 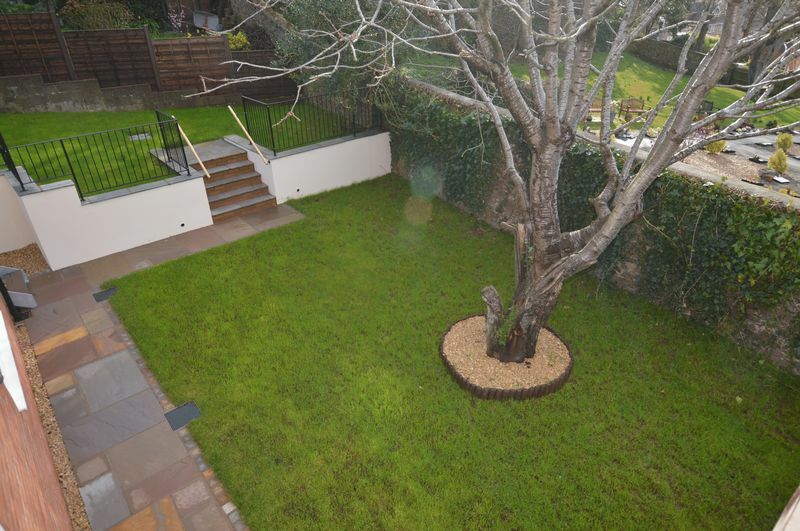 On approach there are well established steps leading down from the block paved driveway to the entrance. 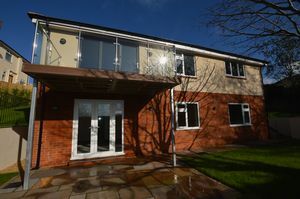 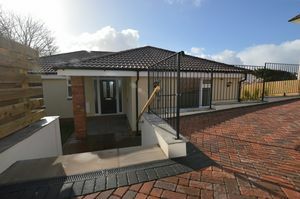 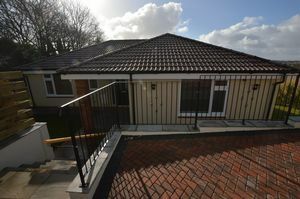 As you enter, the immaculately presented hallway offers a great first impression and leads you onto the cloakroom, impressive kitchen area with quartz worktops and breakfast bar, utility room, superior, spacious lounge with flexibility to accommodate family needs with balcony off, two bedrooms and en-suite. 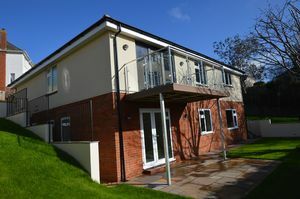 Stairs fall from the landing down to the lower floor where you have access to three further bedrooms, dressing room, two en-suites and superb family bathroom. 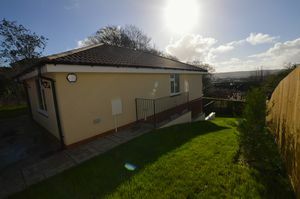 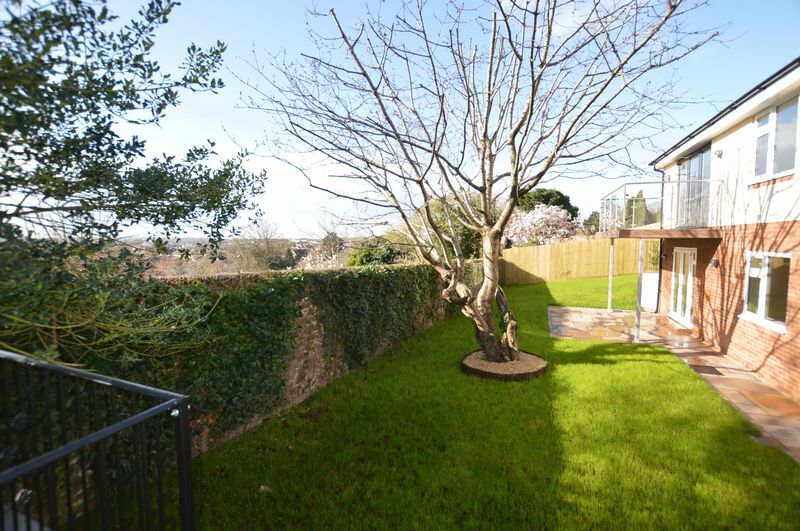 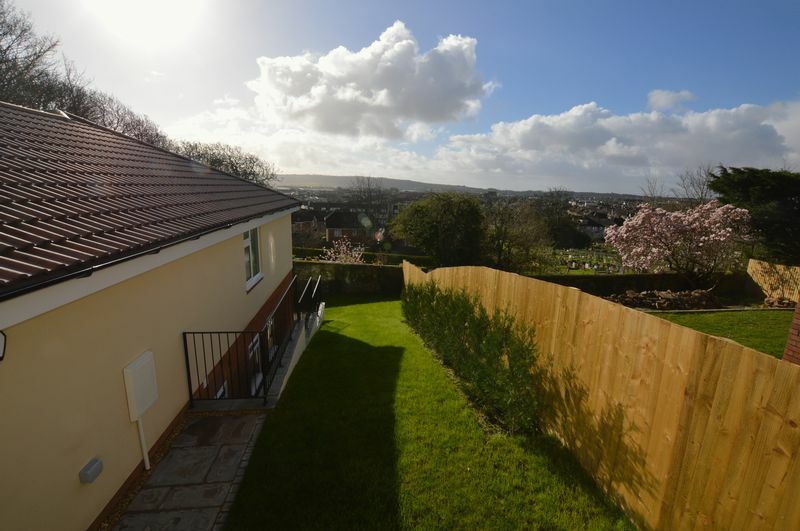 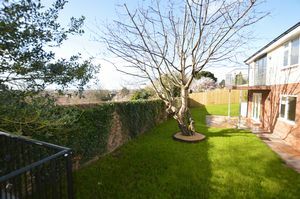 The property also boasts spectacular views over the town to hills beyond, ample off street parking and wrap around gardens. 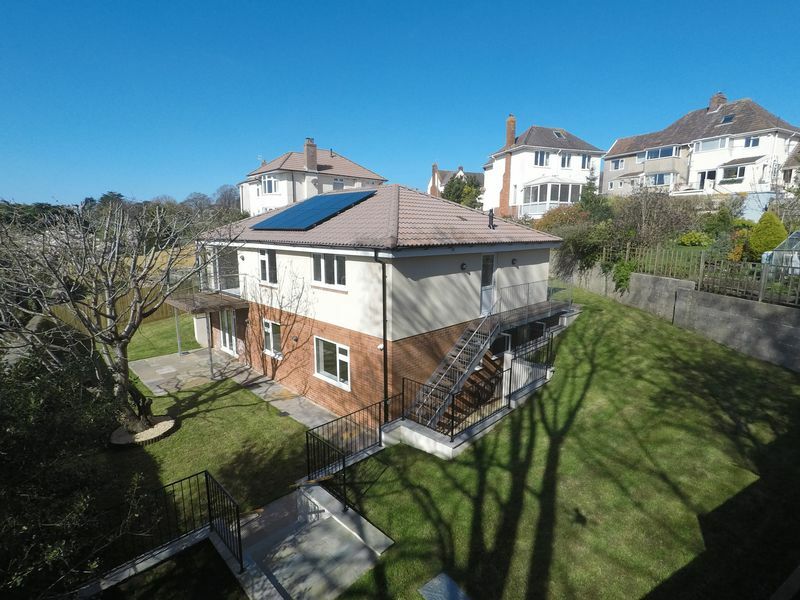 Finished with high-end quality in mind, this could be your forever home and viewing is highly recommended to enable you to appreciate all this superb property has to offer. 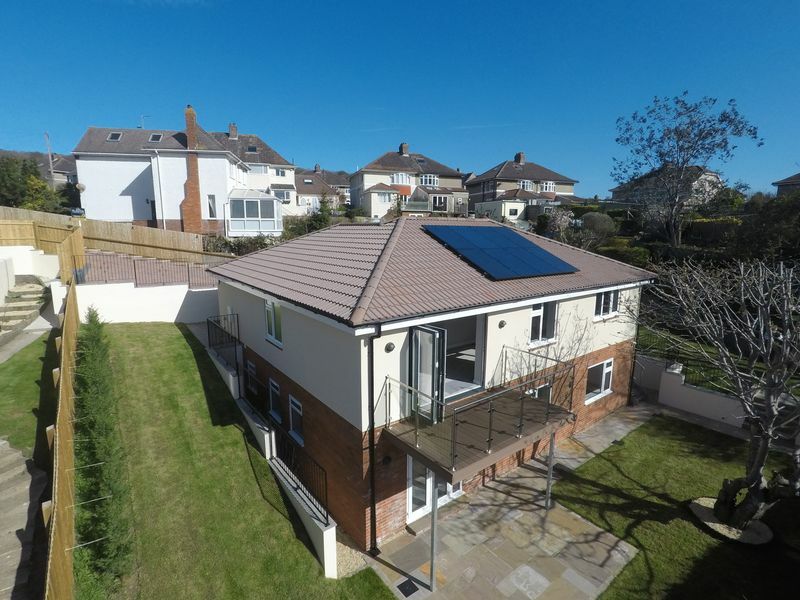 EPC rating B91, Council Tax Band TBC. 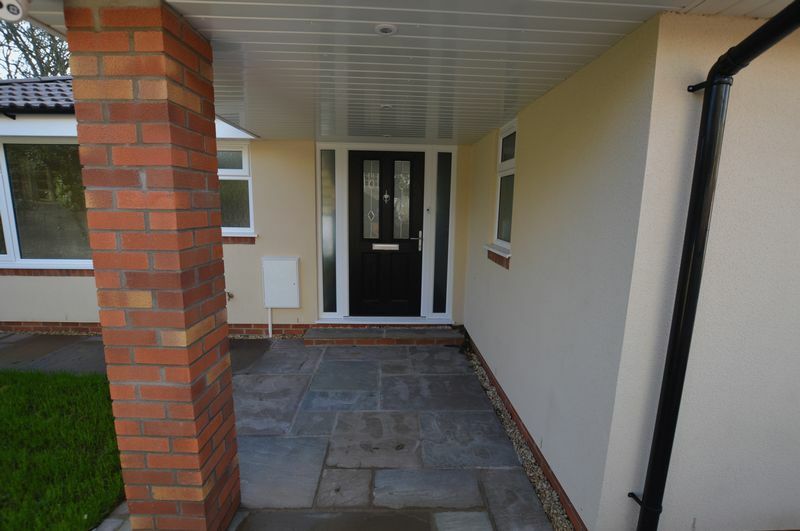 On approach there are well established steps down from the block paved driveway to composite double glazed entrance door into hallway with various outside lights. 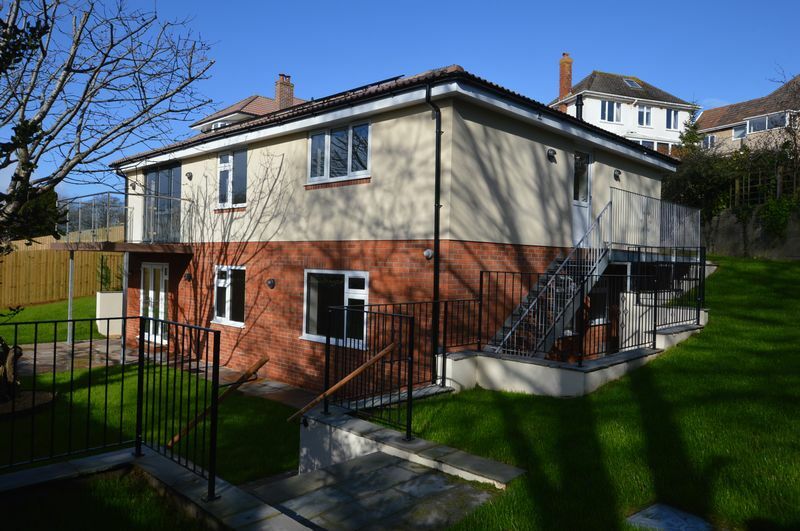 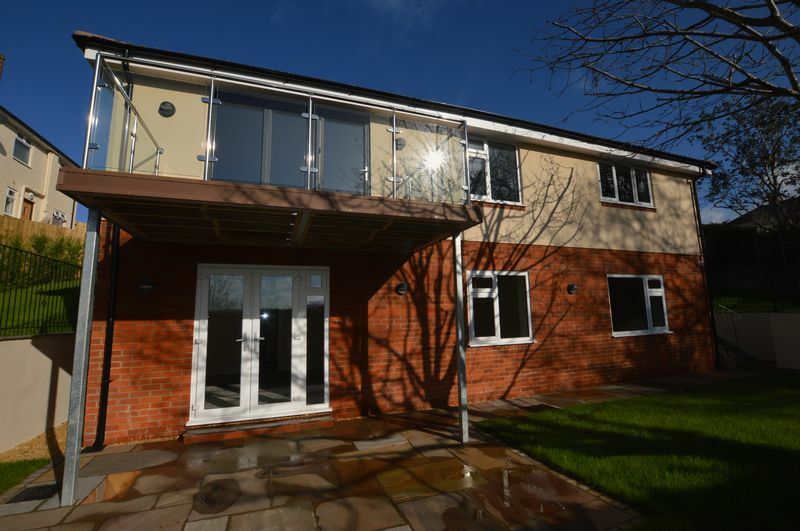 Immaculately presented with timber effect laminate flooring, oak veneered doors to rooms, glass balustrade at the head of the staircase, integrated security alarm system, ceiling spotlights and underfloor heating throughout. 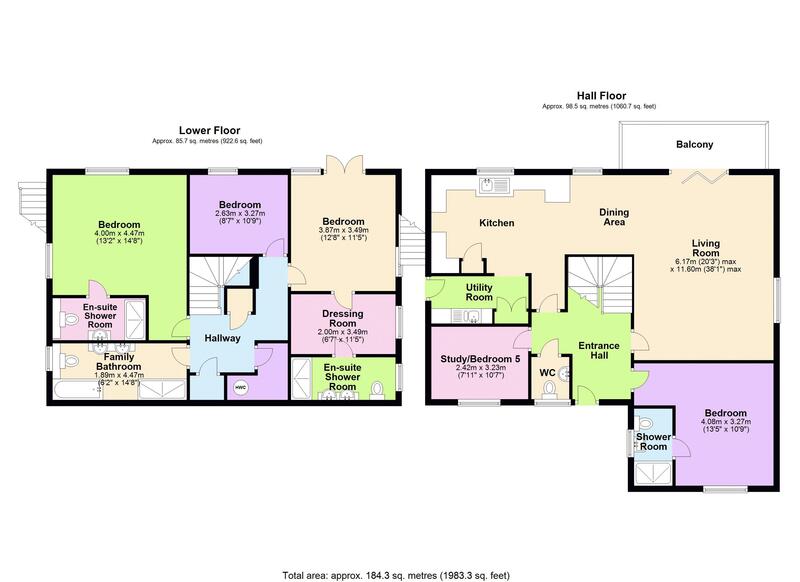 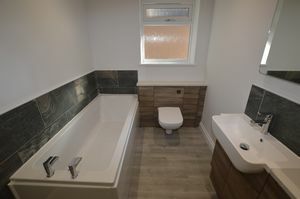 With flooring to match the hallway, there is a low level W/C, wash hand basin set in a vanity unit, UPVC double glazed window and ceiling light. Wow! 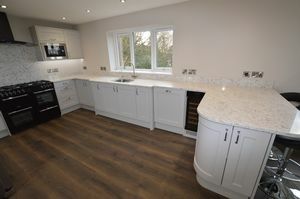 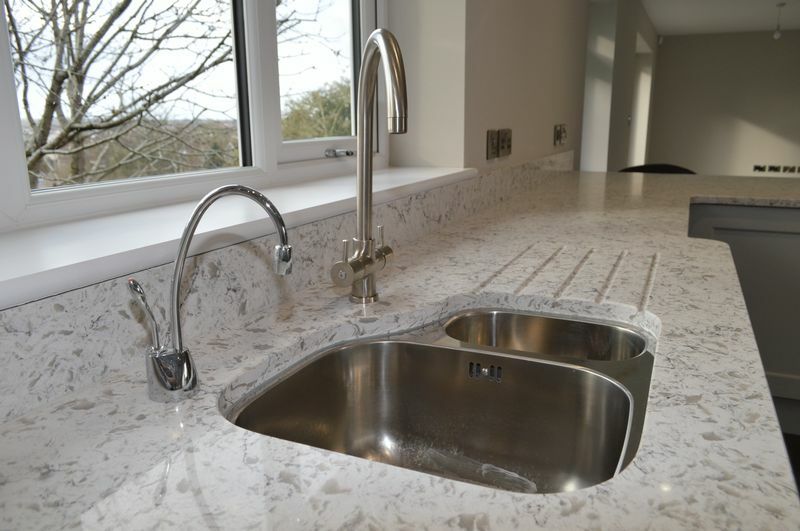 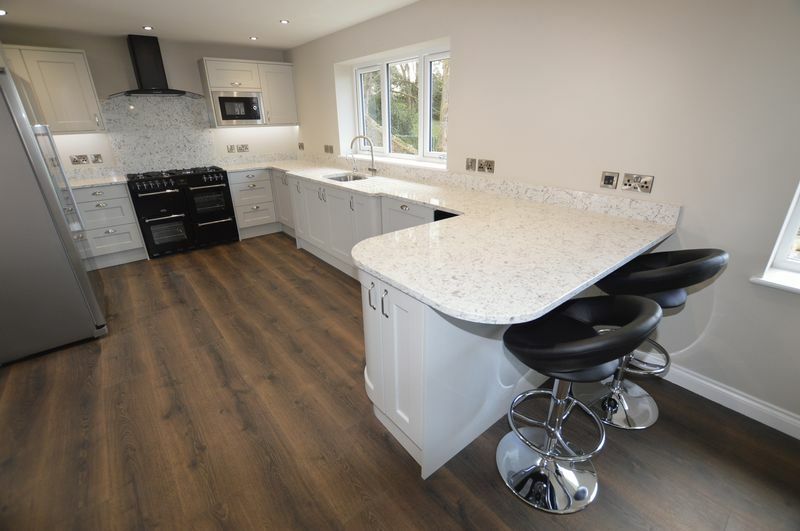 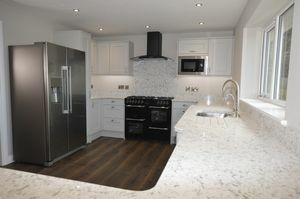 A kitchen to be proud of with a range of wall and floor units and 'Quartz' worktops over. 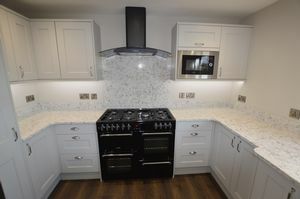 A super 'Belling' seven burner range cooker included with an extractor hood over. Integrated microwave, wine chiller, dishwasher, Samsung American style fridge/freezer, larder cupboard, inset stainless steel sink with swan neck mixer tap and an instant hot water tap positioned beneath the UPVC double glazed window with a view over the rear garden, intimate breakfast bar next to another UPVC double glazed window and leading onto the dining/living room. 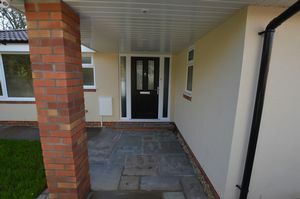 Door to utility and ceiling spotlights. 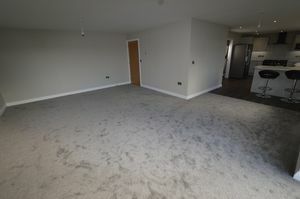 A superior space with flexibility to accommodate family needs. 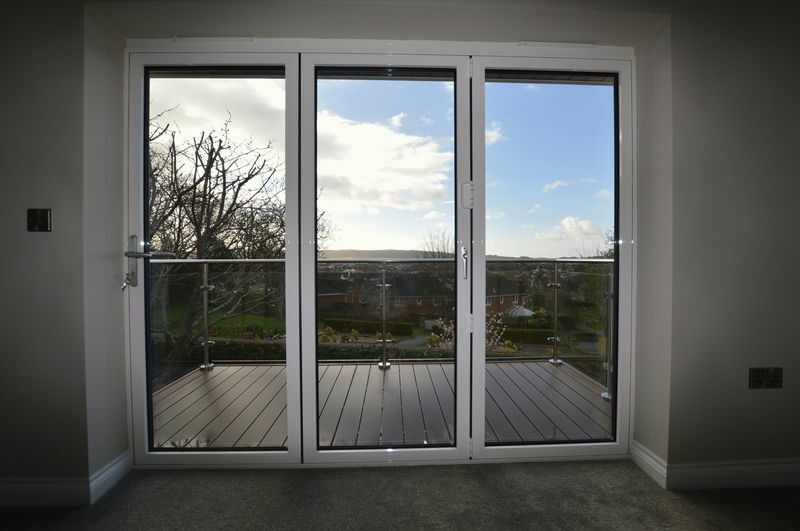 Super aluminium double glazed bi-fold doors onto balcony area, another UPVC double glazed window to side and two ceiling lights. 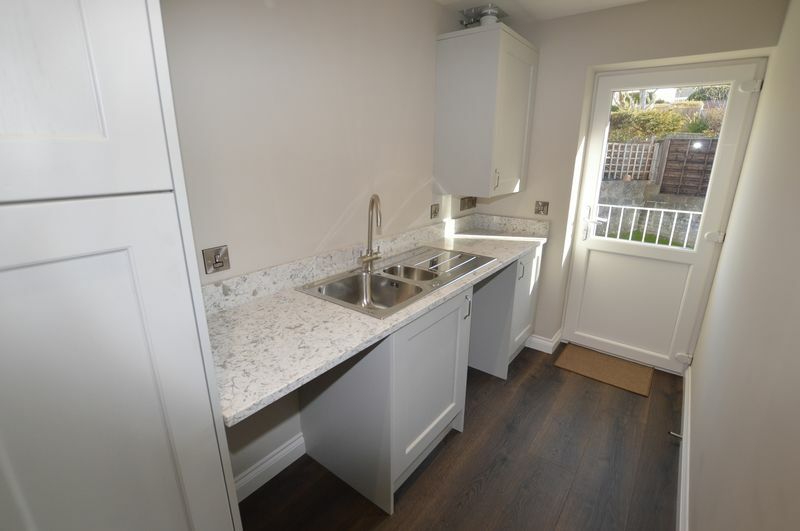 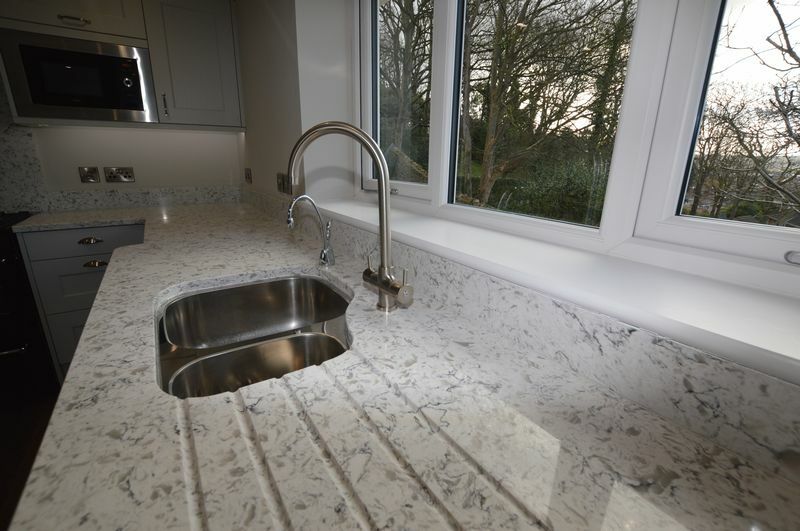 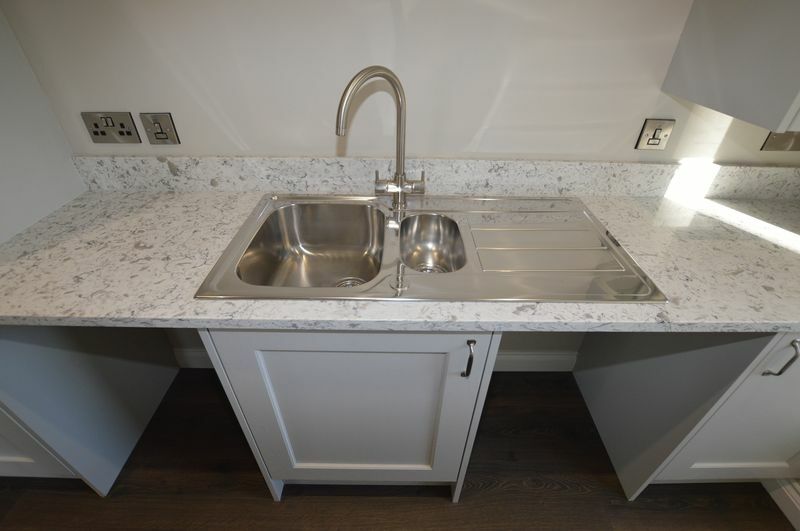 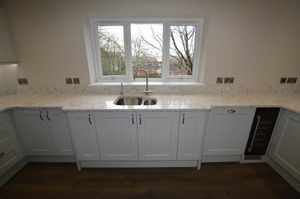 Range of wall and floor units to match kitchen with space and plumbing for appliances, stainless steel one and a half bowl sink and drainer, cupboard housing gas fired 'Worcester' boiler, UPVC double glazed door to outside and ceiling spotlights. 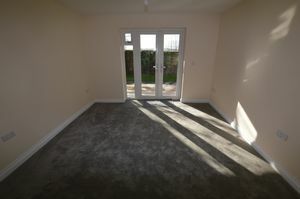 Lovely room with UPVC double glazed window, loft access and ceiling light. 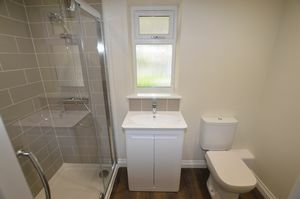 Super double bedroom with UPVC double glazed window to front, door to en-suite and ceiling light. 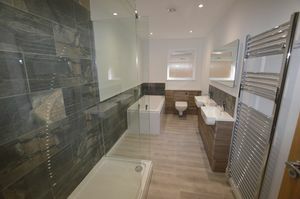 Timber effect laminate flooring, low level W/C, wash hand basin set in vanity unit under UPVC double glazed window, enclosed mains fed shower with 'waterfall' style shower attachment, extractor fan and ceiling spotlights. 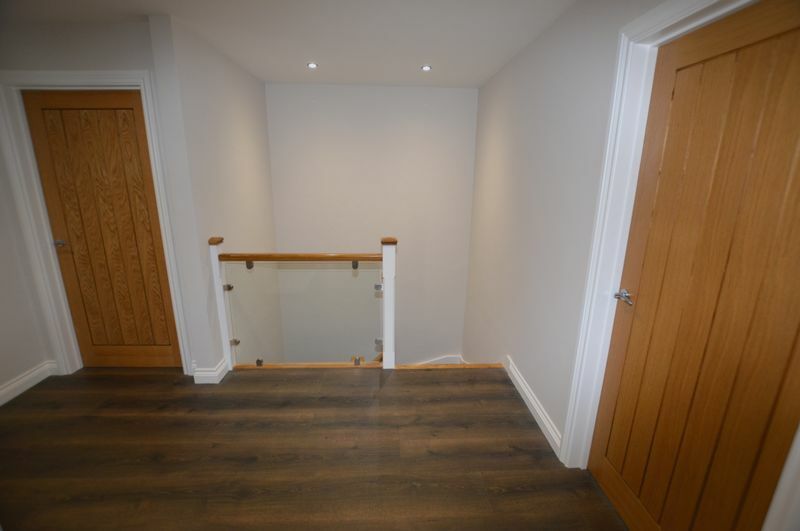 Stairs falling to lower floor from entrance hallway. With doors to all rooms, useful understairs storage cupboard, useful airing cupboard housing hot water tank and another cupboard. Double bedroom with super UPVC double glazed patio doors onto garden and another window to side, door to dressing area and ceiling light. 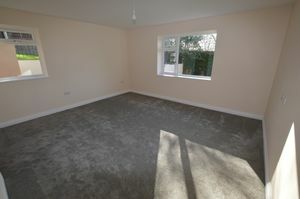 Blank canvas dressing area with UPVC double glazed window and ceiling spotlights. 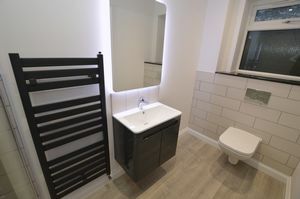 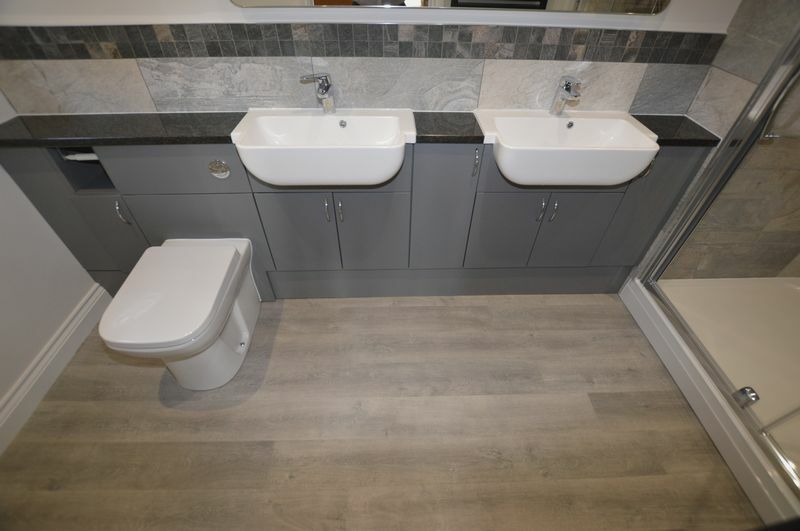 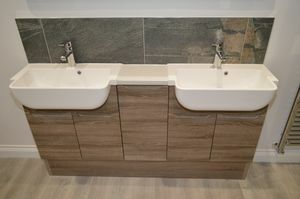 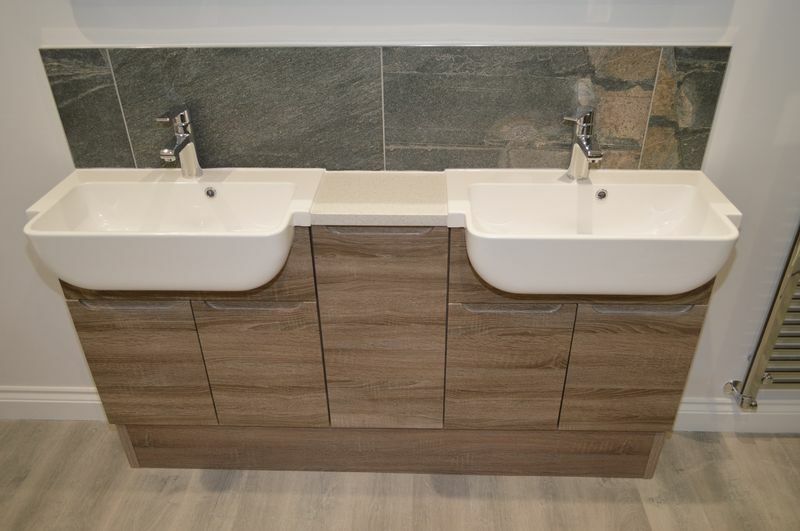 Timber effect laminate flooring with his and hers wash hand basin set in vanity units, part-tiled walls, enclosed mains fed shower, heated towel rail, UPVC double glazed window, extractor fan and ceiling spotlights. 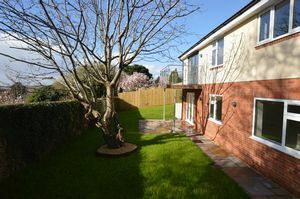 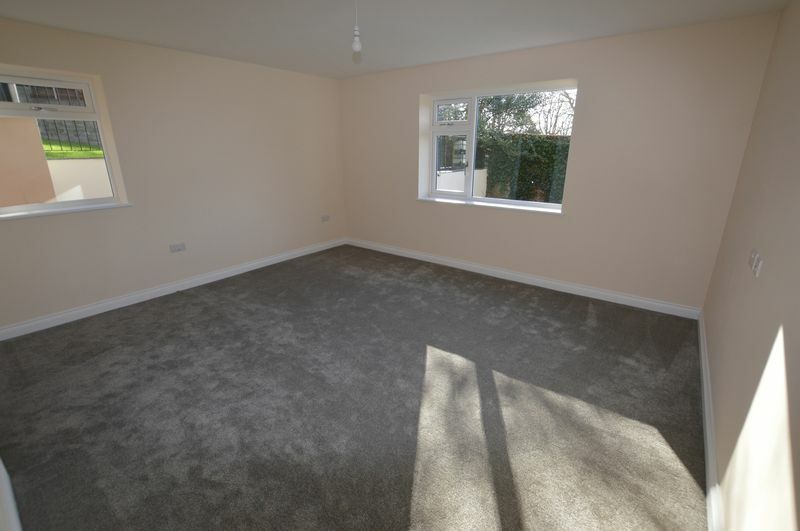 Double bedroom with two dual aspect UPVC double glazed windows overlooking rear garden, door to en-suite and ceiling light. Laminate flooring, low level W/C, wash hand basin set in vanity unit, walk-in style mains fed shower with shower tray and glass screen. 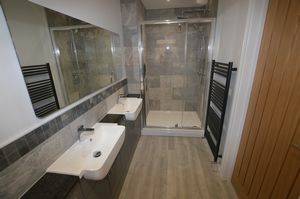 Heated towel rail, UPVC double glazed window, extractor fan, part-tiled walls and ceiling spotlights. Bedroom with UPVC double glazed window and ceiling light. Wow! 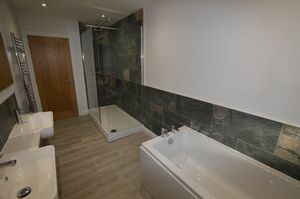 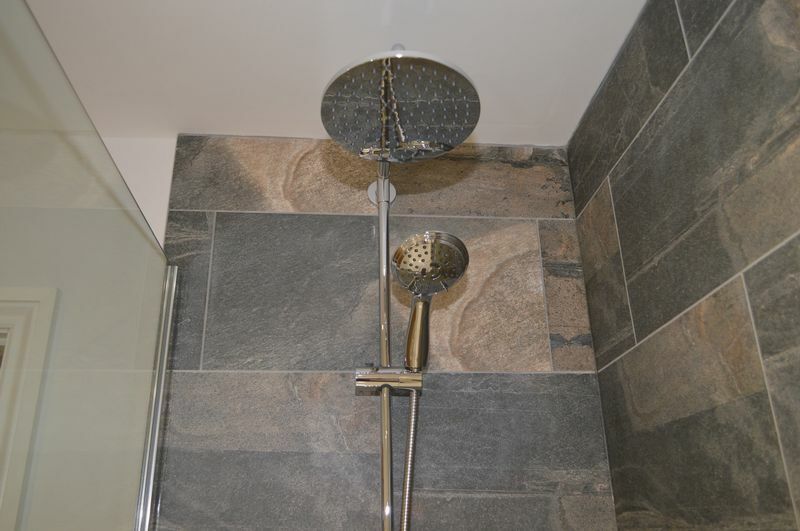 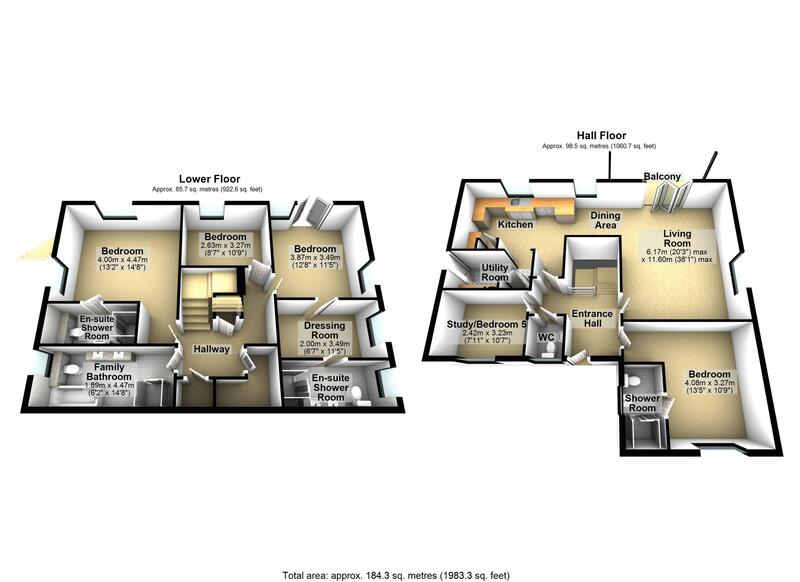 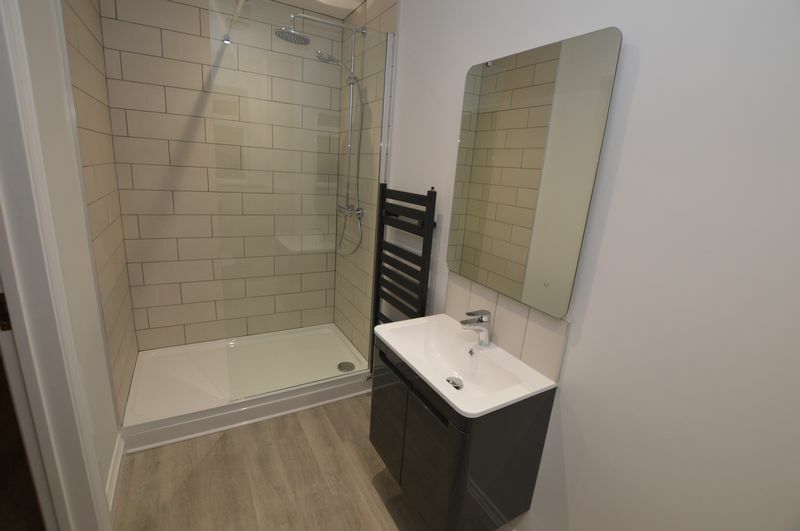 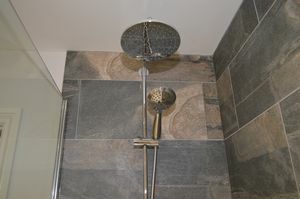 Laminate flooring, low level W/C, two wash hand basins set in vanity unit, panelled bath and separate walk-in style mains fed double shower with shower tray and glass screen. 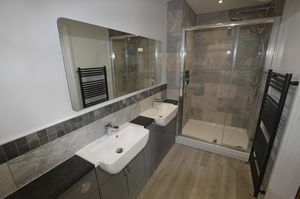 Heated towel rail, UPVC double glazed window, part-tiled walls, extractor fan and ceiling spotlights. 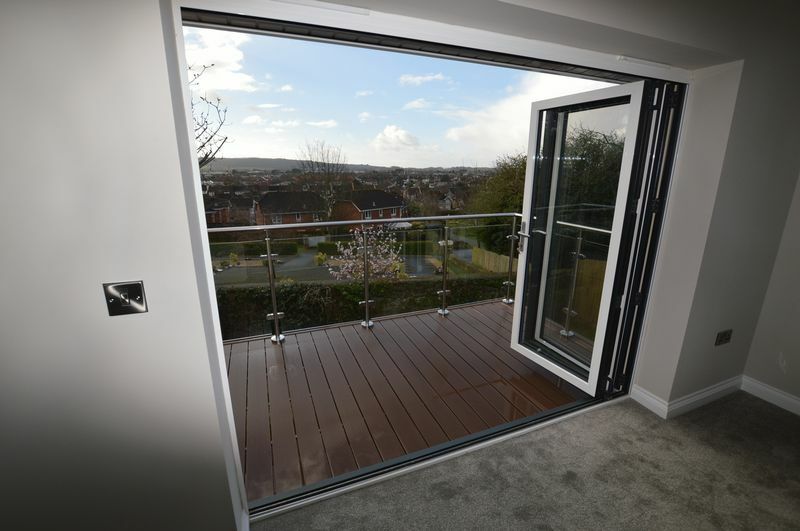 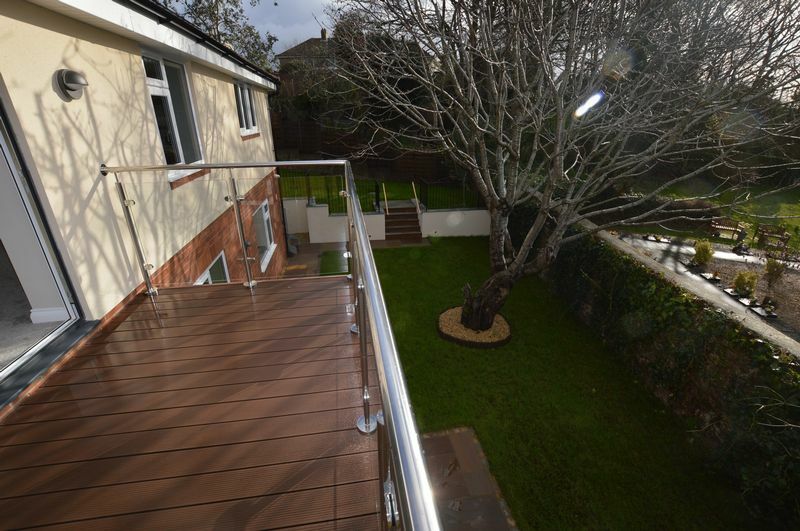 Composite 'timber style' flooring with a glass balustrade and metal handrail. Recently laid slab pathways and patio areas provide the perfect seating spots leading onto level lawn area and enclosed by stone walls. 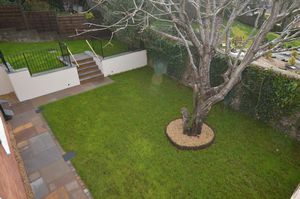 There are steps up to another tiered area which is laid to lawn. 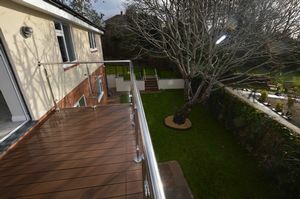 Various outside lights with galvanised staircase rising to utility room. On approach there is a super block paved driveway leading to a parking area. 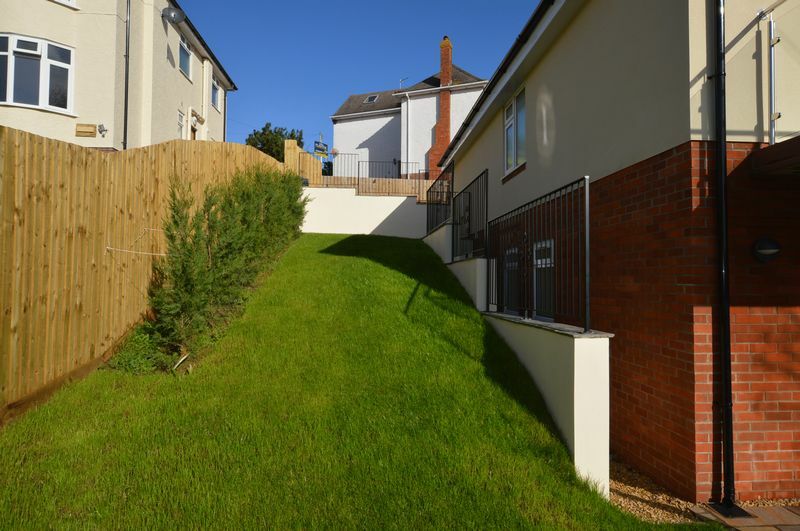 steps lead down the sloped driveway for ease of access, further steps lead to a slab patio to the entrance door and side access.